A R Rahman’s 99 Songs First look Poster Released : AR Rahman has recently released his first film 99 Songs first Look poster. It seems that the poster is gorgeous and ethereal. When the Oscar Award winning music composer A R Rahman has declared that he is making a feature movie, all the eyes of his fans were glancing at him for checking out what he would be creating as a producer for the first time. 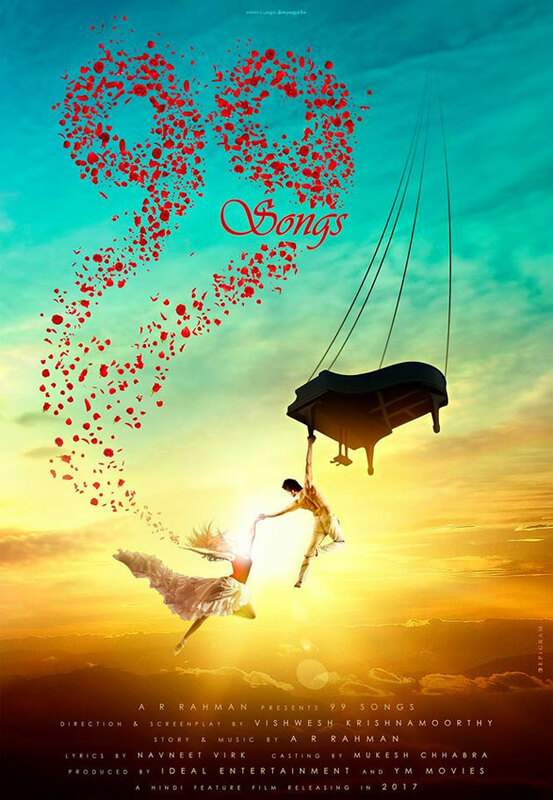 A R Rahman has released the first poster of his film 99 Songs. The double Oscar winning composer’s debut home production, 99 Songs, will commence its shooting soon. Taking to his Facebook account the Mozart of Madras unveiled the first poster. The film is said to be a musical and the audio album will comprise of 10 songs and Rahman has already composed five of them. This Tamil-Hindi bilingual film has been named ‘99 Padangal’ in Tamil and it will be produced under Rahman’s newly set up production house, YM Movies. Directed by Vishwesh Krishnamoorthy, known for his TV docu-series The Dewarists, 99 Songs is set to release in 2017.